Well-appointed cabinetry. 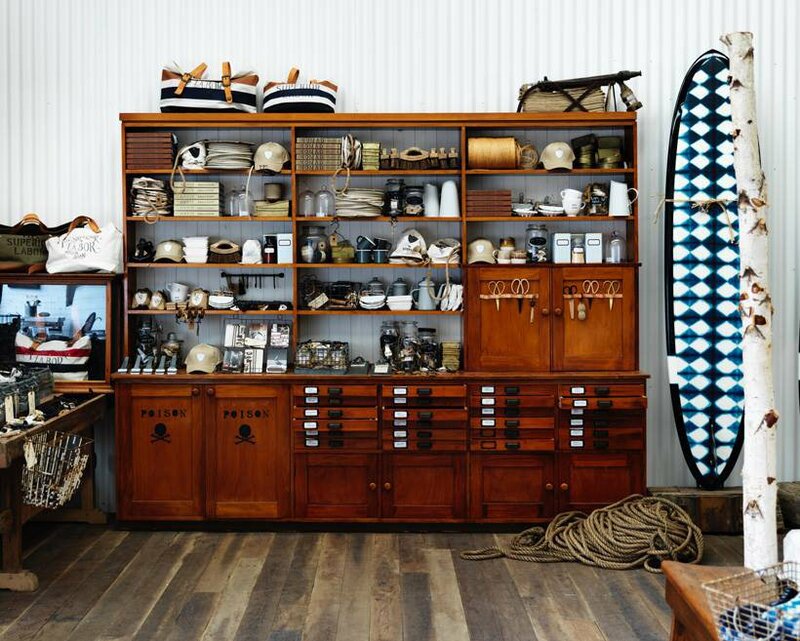 Photo courtesy of Society Inc.
On a little side street in Paddington sits a charming shop reminiscent of a general store, complete with vintage signage and a black-striped awning. is filled to the brim with curious odds and ends — Victorian masks, rattan baskets, and enamel jugs — which are painstakingly collected and curated by interior stylist Sibella Court. In addition to running her shop, Court is an and designer of and . An expert in haberdashery and notions, Court knows the artsy side of the city better than anyone. We asked her to share a few of her most treasured spots. Local coffee shop/breakfast spot: In the morning I exercise and take a quick dip at . Nothing like starting the day and clearing the cobwebs with a refreshing swim. Up the hill is (a fave place to have a cocktail — get the No. 8 and crab spaghetti in a bag), and to the right you'll find my favorite breakfast spot. I don't even know the name, but it's where I get my first soy latte of the day. They also do the BEST fruit salad with yogurt and crushed nuts. Where you go when you need inspiration: , tucked on the campus of It's full of natural history, scientific instruments, stuffed animals, and beautiful bird skins — you're transported to another world. Best spot for people-watching: at in CBD. Watch the partygoers head into various bars and clubs while you sip rosé Champagne. Where is your office? Above my shop, The Society inc. When I hear the bell tinker downstairs, I leave the trestles I share with my assistants (and skyscrapers of paper) to chat with visitors. Preferred mode of transportation: My beautiful green bicycle from . Where do you go when you want to be in the middle of it all? in Surry Hills. You'll find this Mexican pop-up (so popular, it's staying for good) jam-packed every night of the week with the city's trendies. They have tacos, jalapeno margaritas, colorful stencils in sunset colors, Mexican oil-cloth, and a DJ spinning on weekends. We designed and created this space in just seven days by ripping out the ceiling and painting every surface! Most underrated thing in your city: Bush and coastal walks. We are so close to nature in the city of Sydney, but most people don't take advantage of it. There's a really good walk from . Do it in the springtime when the wildflowers are out. Most overrated thing in your city: There is nothing overrated! Sydney is gorgeous, I love it. I moved back here from New York, my second home. Best place for an afternoon drink: If you need to rest your weary feet after a day of shopping and exploring, stop by in Rushcutters Bay for a cocktail. Favorite local shops: The Society inc., of course, and in Redfern. There's a great little pocket of design shops in Redfern now, so have a wander and then come and visit me! You dream about your meal at: in Chinatown, New York. Just down the road from my old apartment. They make the best dumplings in the whole world. Favorite local icon/monument/institution:. I start every day here, it makes me happy. The best thing about your neighborhood: is so leafy and green with wide streets, its unreal. Favorite local slang: Hoodwinked and trickster! Those are just mine. I'm researching the history of Sydney crooks for a speakeasy I'm designing. Best book or movie based in your fair city? Right now it's by . All about Sydney's shady past! No trip to Sydney is complete without: An early morning dip in the ocean — you will feel alive all day.